This is a another of my easy to make birthday cakes for kids. 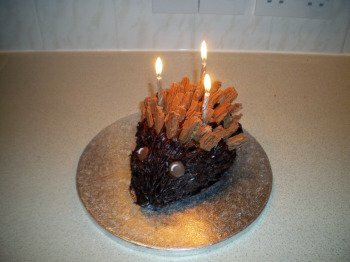 I originally saw this chocolate hedgehog cake design at a friends party, although she had baked the cake also. It's simple to make and the kids can get involved too. If you buy a loaf shape cake from the supermarket, there's no baking involved, so not hot ovens and cake tins. 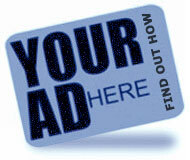 Of course if you'd rather bake the cake than buy one, you can do that too! If you haven't seen the puppy birthday cakes you may like to have a go at making those. 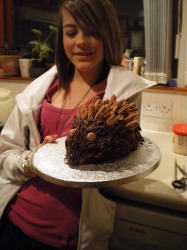 1.Carve a basic hedgehog shape from the cake using a sharp knife. 3.Cover the entire cake with your chocolate or fudge frosting. This needs to be done quite thickly so it holds the flakes well. Don't spread too hard or it starts to take the sponge off and you end up with lots of crumbs in the frosting. We found it best to spread the icing out gently with a fork and then make lines to represent hair with a cocktail stick. 4.Break up the flake into thin pieces about 1inch long, and stick them into the icing all over the cake, until it starts to look like a hedgehog! 5.You're nearly there. All that needs to be done is decorate the face with a little nose on the snout and 2 eyes. We thought the eyes looked a little plain, so we cut 2 small crescent shapes (using a straw) from white roll out icing left over from the puppy cakes. These were stuck on using a lot of good luck and will power. This last bit was in fact the most difficult bit of the cake. 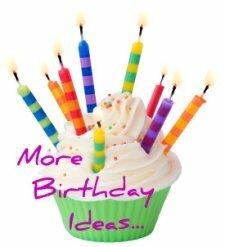 Making birthday cakes for kids doesn't have to be all time consuming. As a working mum it can be difficult to find the time to fit in everything we'd love to do. 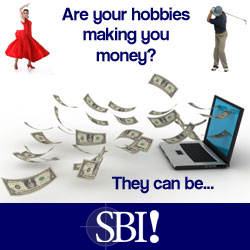 Including spending all day making and decorating a gourmet cake. 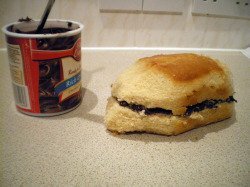 That's why I've always found these simple cakes a great solution. I also love the fact that they were safe and easy for the kids to help with.